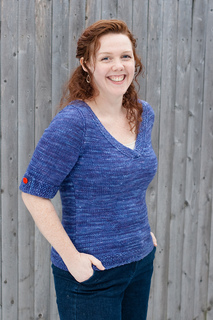 This pattern is available from customfit.amyherzogdesigns.com for $12.50. 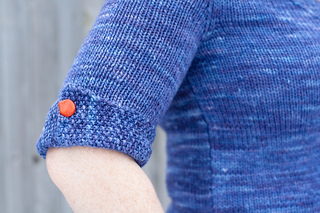 Arm Candy is now available only via CustomFit, my custom sweater pattern generator. 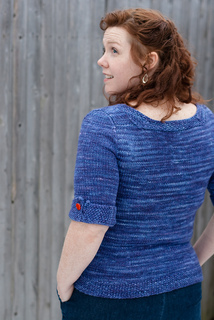 CustomFit Arm Candy custom patterns are $12.50 and will give you a sweater that looks exactly like the original sweater, but all of the pattern numbers have been created exclusively to match your gauge, your body measurements, and your length/sleeve preferences. For the fully customizable version of Arm Candy, go HERE. 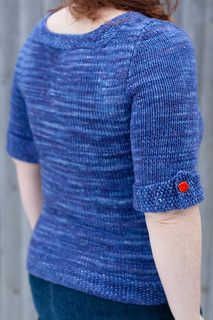 Arm Candy figure-conscious, elbow-sleeve V neck with seed stitch and button trim details. 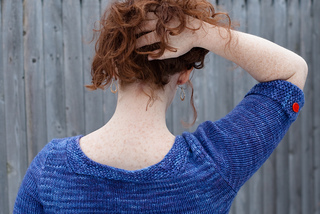 Yarn-wise, the sweater works dressed up for work or down for play and looks gorgeous in fancy, hand-painted yarns. 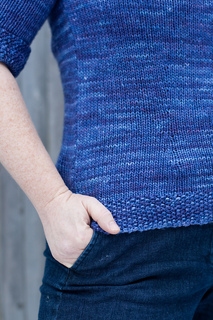 Shown in Sundara Aran Silky Merino, color “Wild Blueberries”, 5 (5, 5, 6, 6, 7, 7) hanks, but your favorite aran or worsted weight yarn will look divine, too.